The top things to do in Pelion all show off the diversity of central Greece’s mountainous, coast hugging landscape. Explore with the sea, sand and snow in mind. 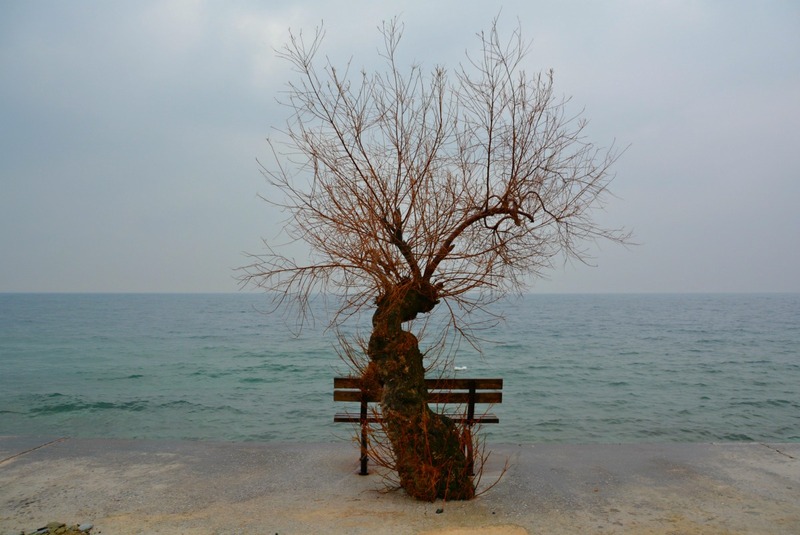 Pelion is the peninsula region of Thessaly known for its beautiful mountains, but not only. The eastern edge of those cliffs dip dramatically into the Aegean Sea while the western side curls around the Pagasitikos Gulf. 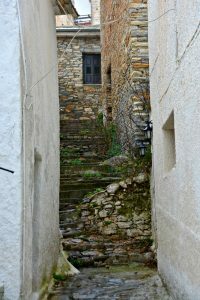 Off of Pelion’s circuit of super curvy roads are Pelion’s fantastic villages. In the most scenic of them, traditional timbered homes pepper the slopes, known for their slate roofs, sturdy yet scenic balconies as well as the cobbled paths and lanes that cross through them. 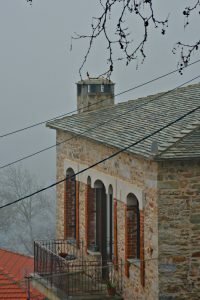 Pelion attracts visitors all year round. Here, the sun, sea and snow meet the Greek mountains. 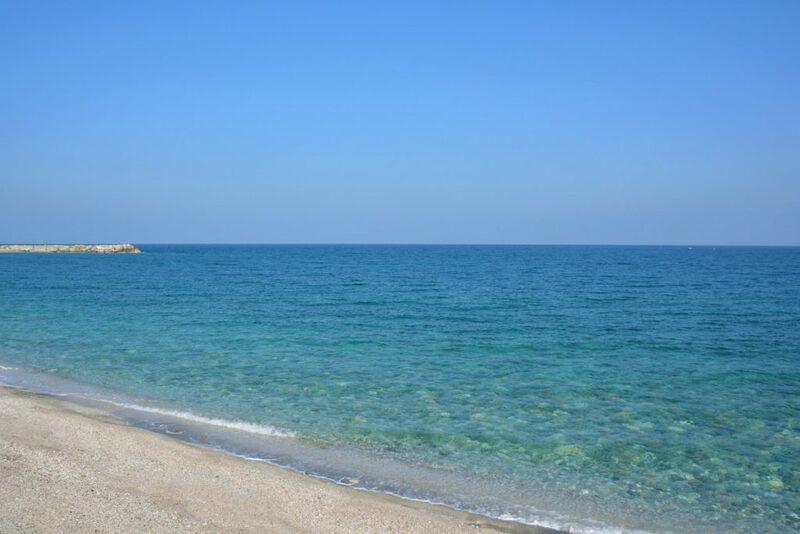 I know Greeks who regularly travel to Pelion for a summer break, a fall getaway, a cozy winter holiday or for springtime trips especially around Greek Easter. In short, nature blooms all four seasons here. 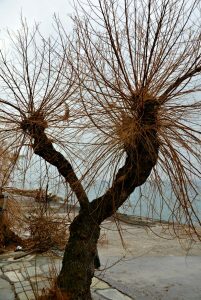 While I was in Pelion, at the end of January, I experienced the region brightened by the winter sun as well as misty with fog and in some parts, under a blanket of snow. 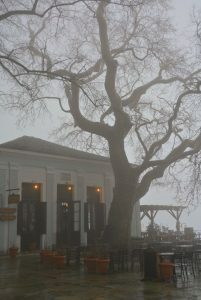 I’d say winter in Pelion is charming, without thick summer crowds. Quiet and scenic. 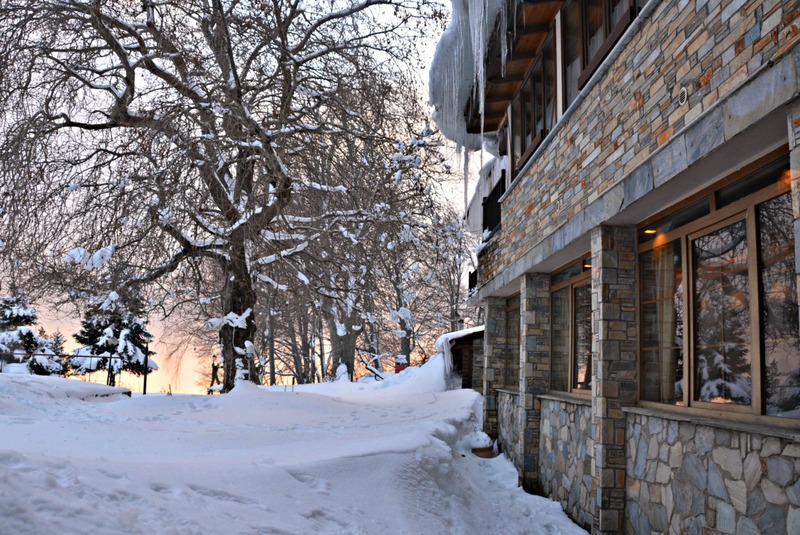 Snow at dusk at Manthos Hotel in Chania. No matter what time of year, the very winding roads make for slow driving. I know, I tend to get motion sickness. Still, it was worth it and I’d go back in a heartbeat. I’d say it’s difficult to drive around in just one day to visit the top sights and appreciate the peninsula’s beauty. It’s best to take your time. Definitely split your time between the west side and the east side. The traffic-free coast of Damouhari has a more recent claim to fame as the location of the “Dancing Queen” scene in the Hollywood movie Mama Mia (2008) starring Meryl Streep. After our hike through Tsagarada we walked through the scenic port. I loved taking in the stunning rocky landscape, which seemed to be both wild and stunning at the same time. 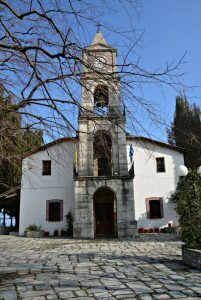 Damouhari Port, Pelion. Meryl Streep was here! 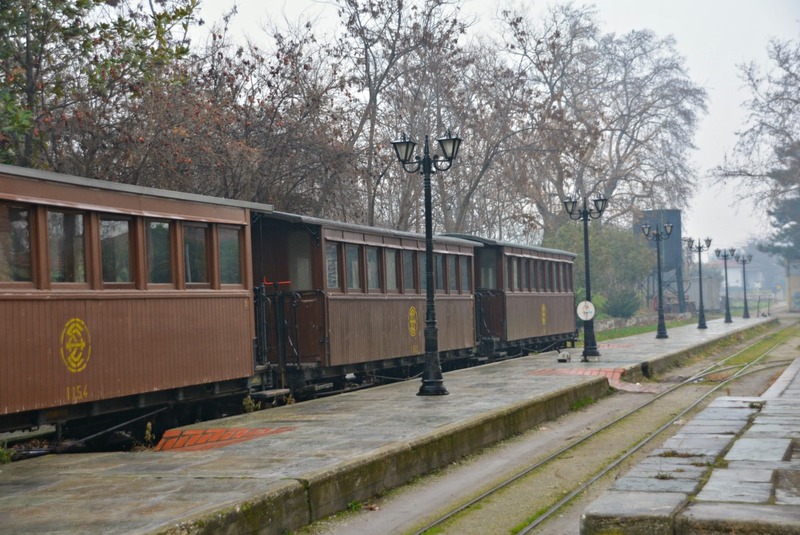 The Pelion Train, also known as the Little Train of Pelion, is a narrow gauge (60 cm) train that seemed to me like a toy train with its maintained vintage look. It’s even parked in a colorful little train station. 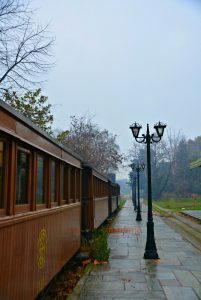 The train began operating more than a century ago between Volos and Lehonia in 1895 and between Lehonia and Milies in 1903. It covers 29 kilometers, on tracks that run through verdant forests and across 12 bridges. Tip: Return tickets are 18€ for adults and 10€ for kids. Further information for tickets, timetables, contact the Travel Office of Volos TRAINOSE +30 24210 39723. I rate a visit to this church as one of the top things to do in Pelion because the stunning interior frescoes took me off guard. Located in the main square of Millies, the actual construction date of the church is unknown. However, it was renovated in 1741. 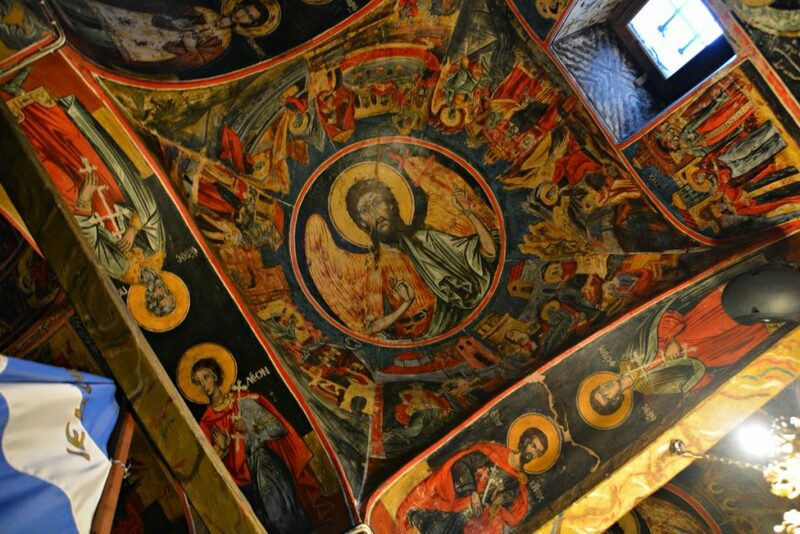 Today, visitors come to admire those impressive frescoes. 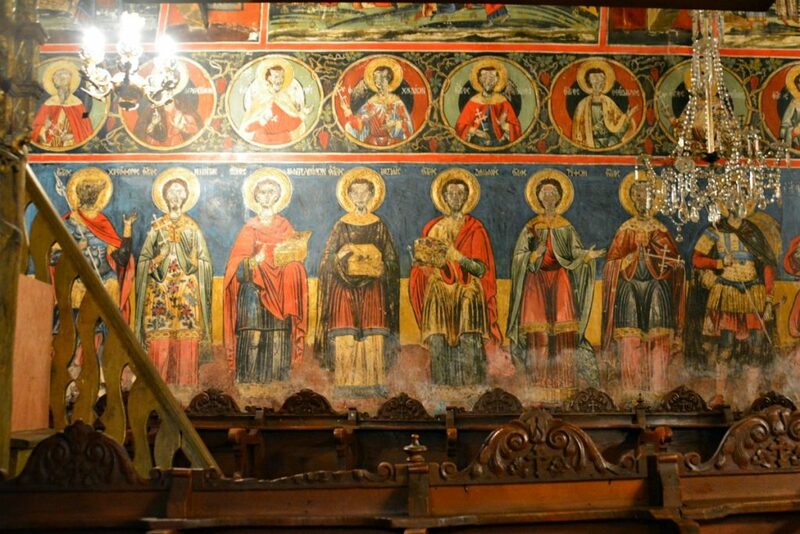 A local guide explained the frescoes were smothered by the black of grit, so the interior of the church was quite grey and black. After careful restoration, the frescoes were revealed. The church is also known for being built with excellent acoustics, including the use of upside jars, four on each dome, to strengthen treble sounds. Tip: This is a stop on the Pelion Train. 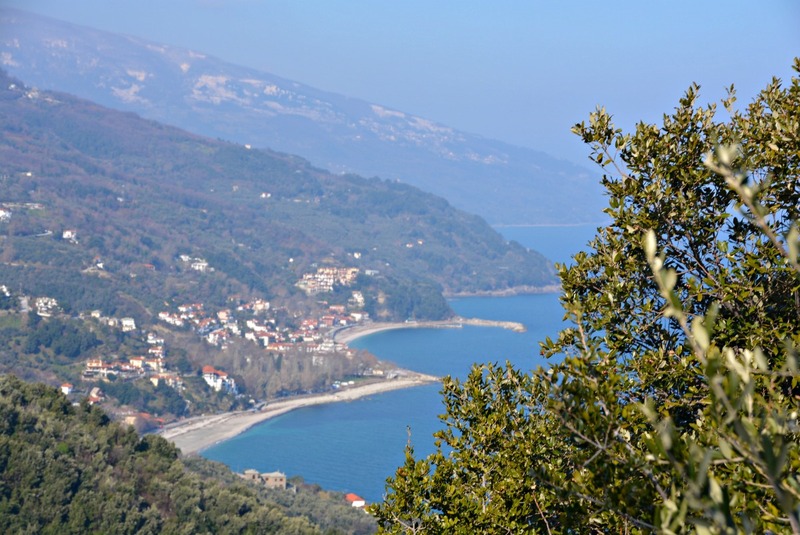 Hiking is one of the top things to do in Pelion, and it was a highlight during my first full day there. Led by Trekking Hellas local guides, our group completed a hike from a trail that weaves itself between Tsagarada to Damouhari. It wasn’t the easiest path, and I’d say a good challenge. There were a good number of stone steps and uneven paths. The walking sticks we were given certainly helped. 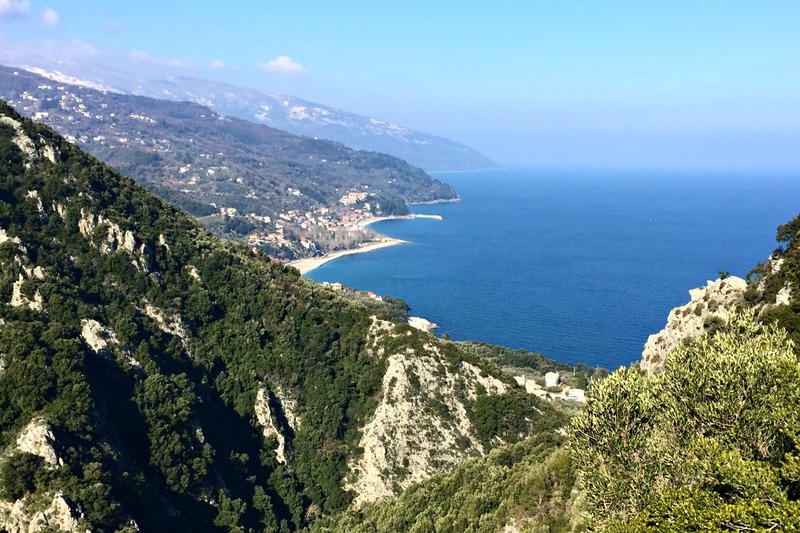 I loved the contrast of mountains and sea, the olive groves we passed, scenic views of surrounding villages and the aroma of mountainous nature. The light snowfall from the day before made it all much more beautiful. At one point, our guide Nicholas led us to this peak where we had to stop and take turns for photos. 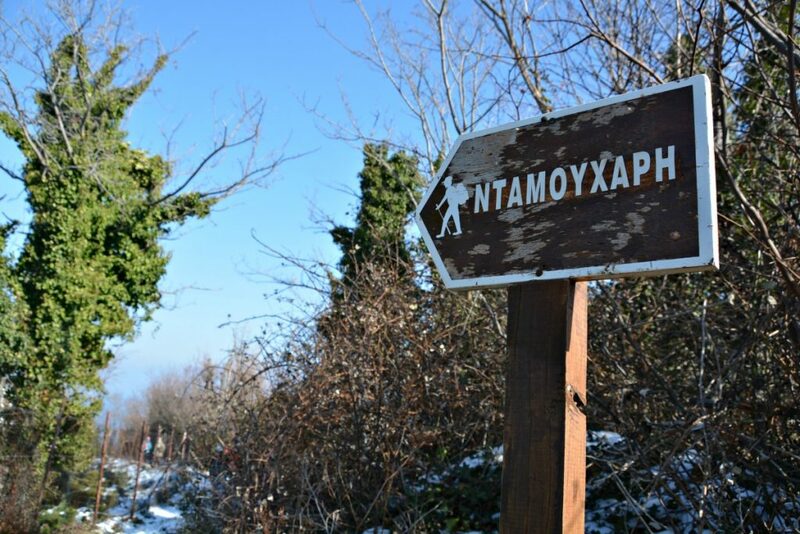 Fun times hiking with Travel Bloggers Greece. 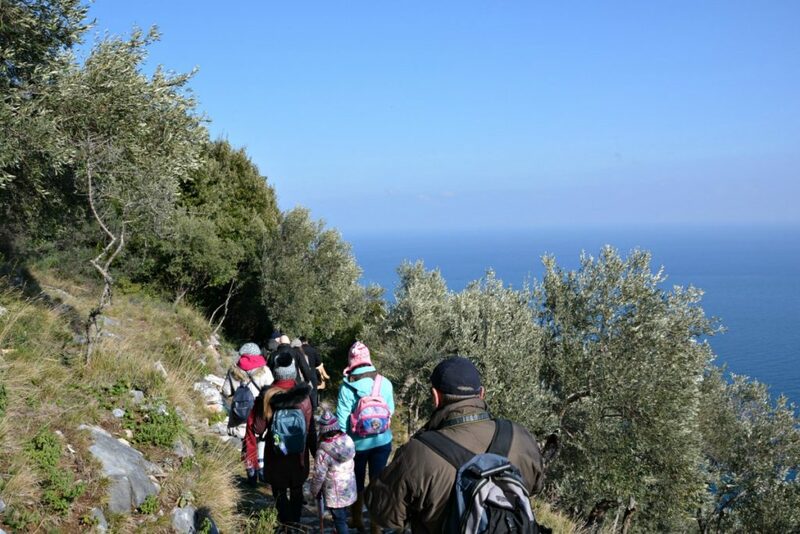 For guided hikes through Pelion, I recommend contacting Trekking Hellas. 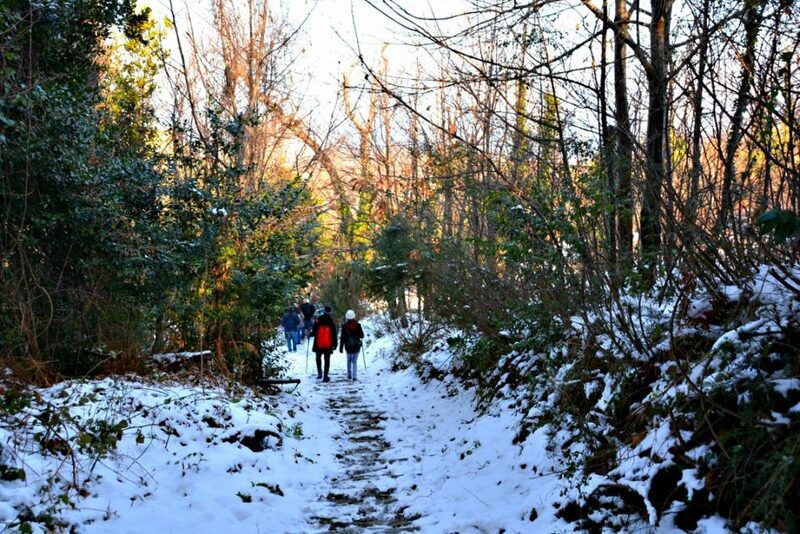 For hikers and walkers, Pelion is a dream. 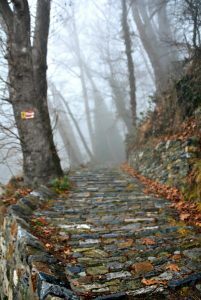 One of the top things to do in Pelion is explore the incredibly dense network of cobblestone trails and paths that interconnect its scenic villages. Yes, that mountain landscape is perfect for skiing or snowboarding and believe me, it gets snowy in those hills. 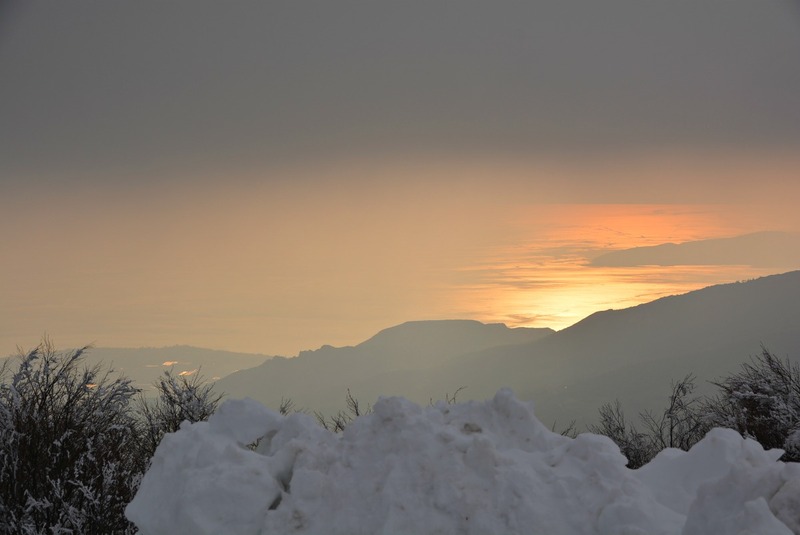 Pelion is home to the Agriolefkes – Pelion Ski Center which has four slopes for downhill ski approved by the International Ski Federation. For more information, visit www.pelionski.gr. 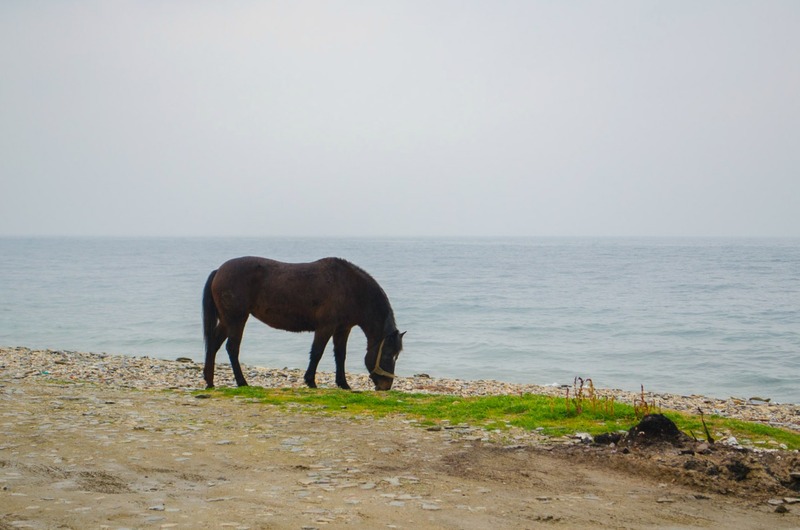 With such incredible natural scenery, horse riding is considered one of the top things to do in Pelion. There are several companies throughout the peninsula offering tours and services. 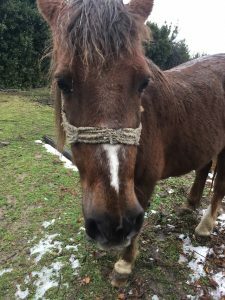 One to try is the Riding-Naturalist Club of Milies. Horse hanging out in Afissos. Photo by Passion for Greece. 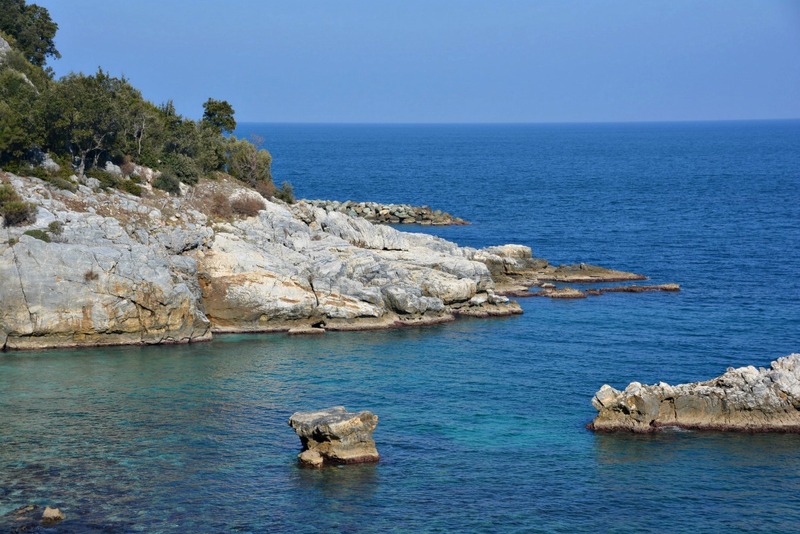 If you love sea and river adventures, it’s another one of the top things to do in Pelion. 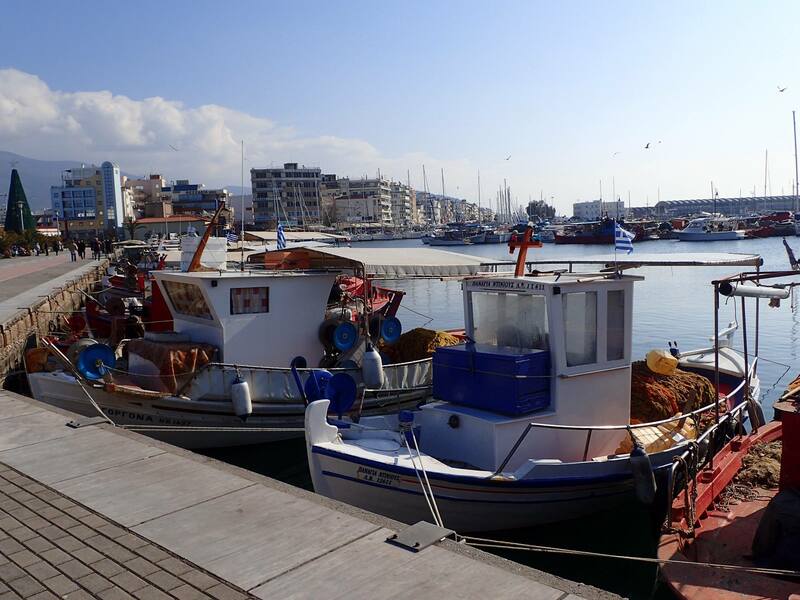 Check out the blog: A Greek Adventure for details on this exciting way to explore the region. 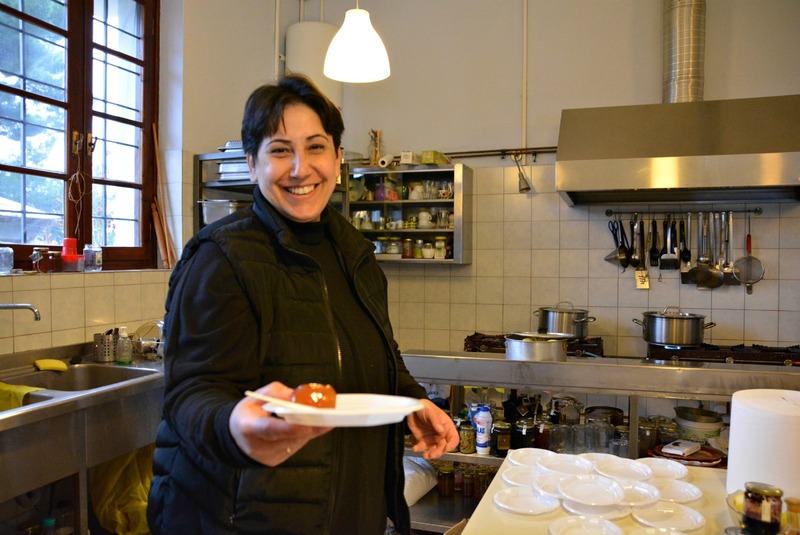 Having eaten my way through many regions of Greece, it continues to astound me just how there are so many types of distinct local flavors and specialties to discover. 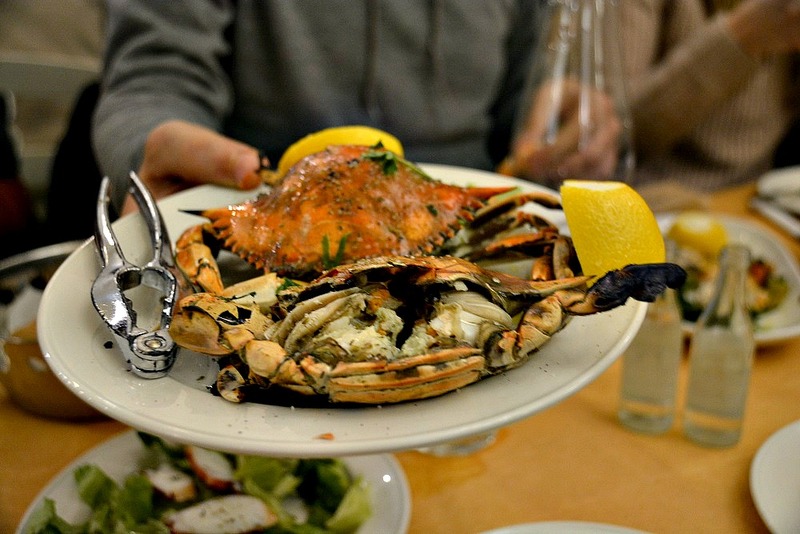 I was truly impressed by many of the dishes I tried in Pelion. In general, be on the lookout for hearty dishes like fasolada (bean soup),kapama (slow roast goat in tomato sauce), boubari (local sausage) kouneli stifado (rabbit stew), spetzofaï (stewed pork sausages and peppers) and tyropsomo (cheese bread). Pelion is known for the tasty and traditional sweet preserves and jams. There are many types to choose from. An exotic one I have come to like is kidoni (Greek quince). Every region of Greece has its drinks and its drink culture. 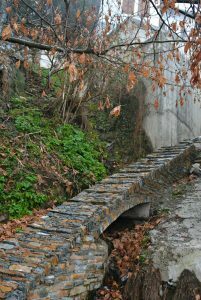 The Thessaly region is the “hometown” of the distinct Greek liquor called tsipouro. The distilled spirit is produced from pomace and contains 40 to 45 percent alcohol by volume. 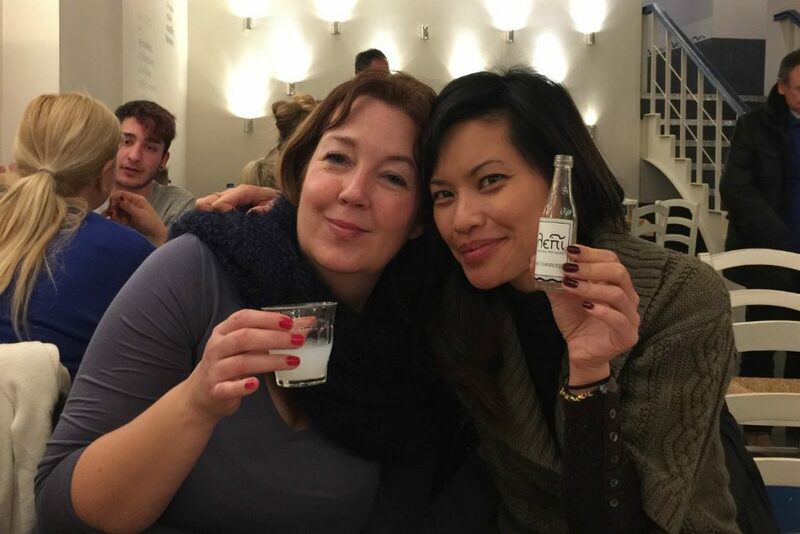 Tsipouro is meant to be drunken slowly, with good company and tasteful small dishes. I recommend trying tsipouro with mezes at Lepi in Volos. With fellow blogger Amber of Provocolate. During the summer season relaxing at the beach is one of the top things to do in Pelion. So many line the peninsula coast. 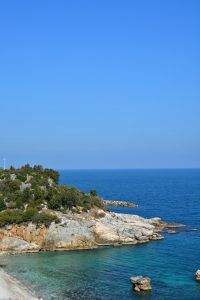 On the Aegean Sea side, head to Milopotamos, Fakistra, Papa Nero, Agios Ioannis, Agioi Saranta and Horefto. 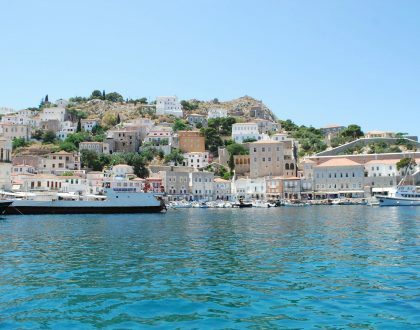 On the Pagasitikos Gulf side, head to Kato Lehonia, Kala Nera and Afissos. 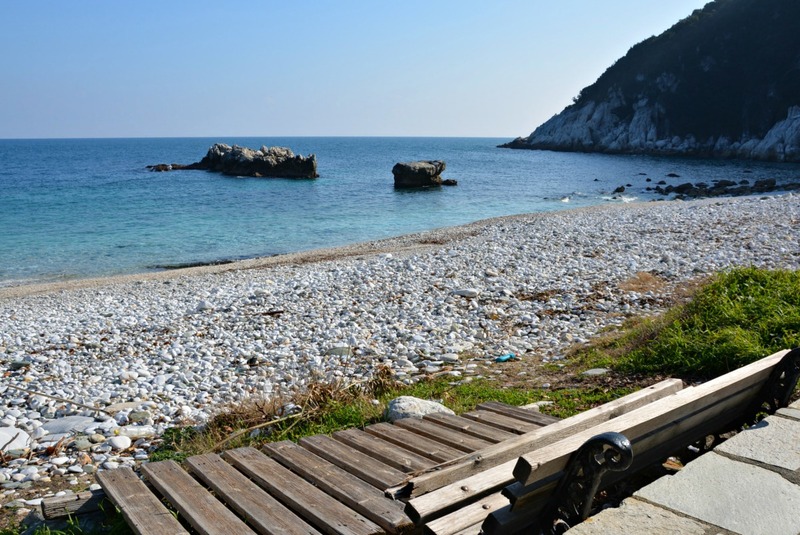 Pelion beach in the winter. 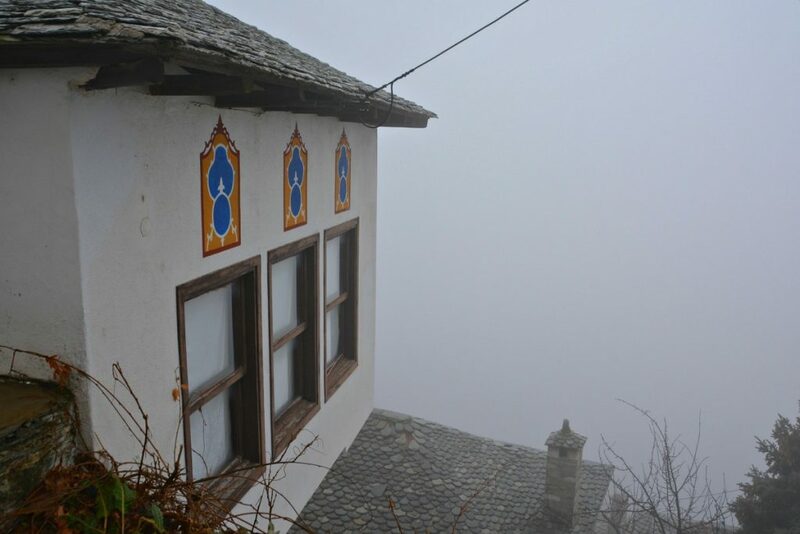 It was rainy, cold, grey and foggy without a bit of sea view to be found yet Makrinitsa stole my heart. If it is so beautiful in drizzle, I can only imagine it in other seasonal colors. 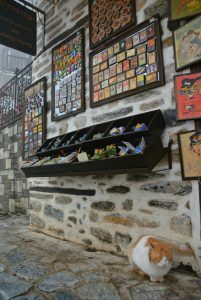 The main pedestrian lane is lined with adorable stonework mom-and-pop shops selling handcrafted items and local products. Ancient trees tower over the main square where a historic fountain and church can be admired as well. 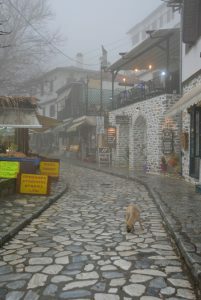 The main path in Afissos was another beautiful experience in cold, rainy weather. 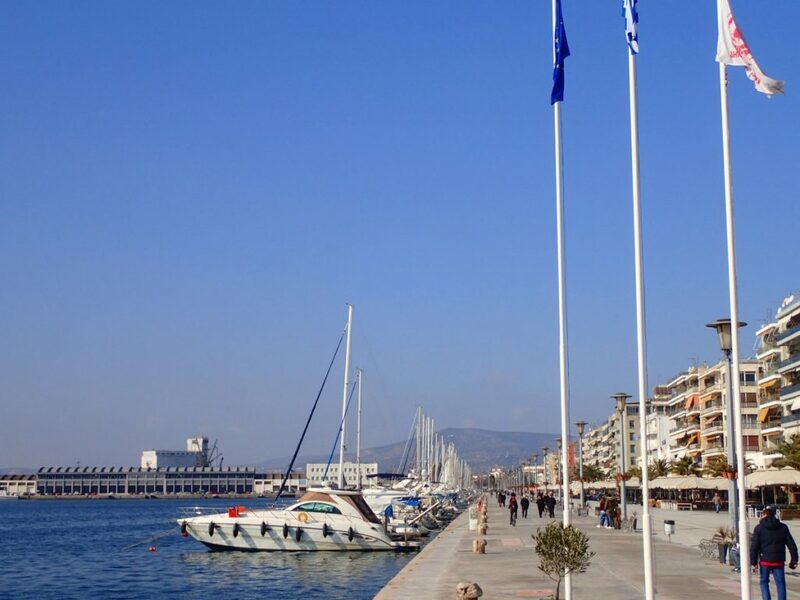 Set by the Pagasitikos Gulf, you can stroll by the sea and choose from a variety of cafes and tavernas to stop for a relaxing drink or coffee. 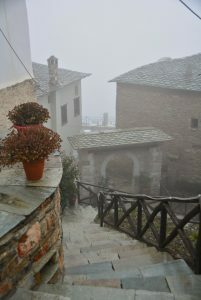 Rainy winter day views in Afissos. Most of the businesses were closed during my walk but I had a lovely coffee at the Hotel Maistrali which had a fireplace blazing next to a perfect sea view. 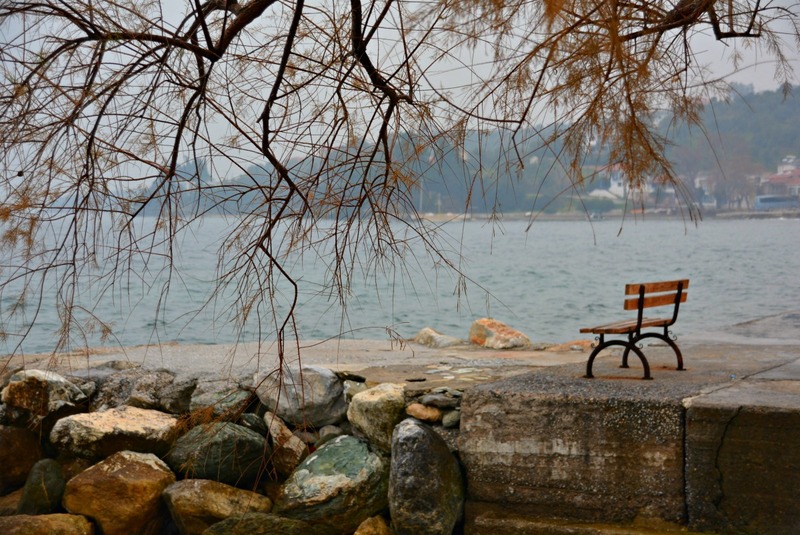 The boardwalk ends at Afissos Beach. 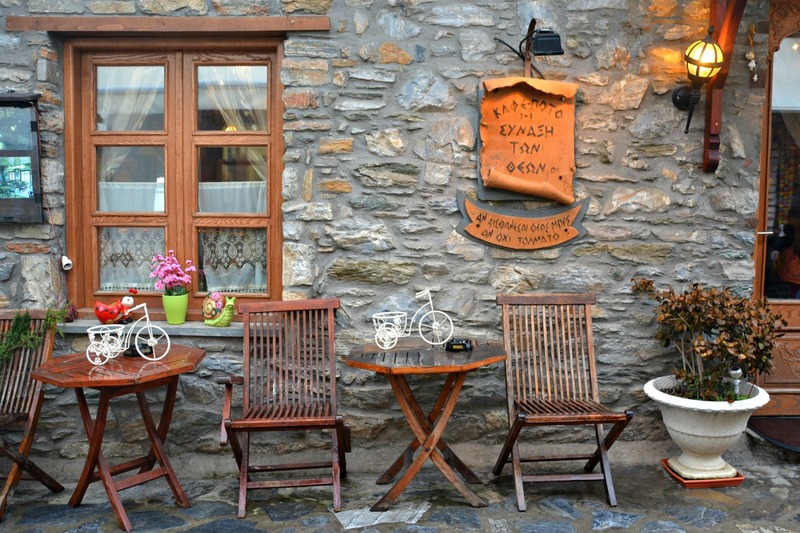 The biggest village of Pelion is Zagora. 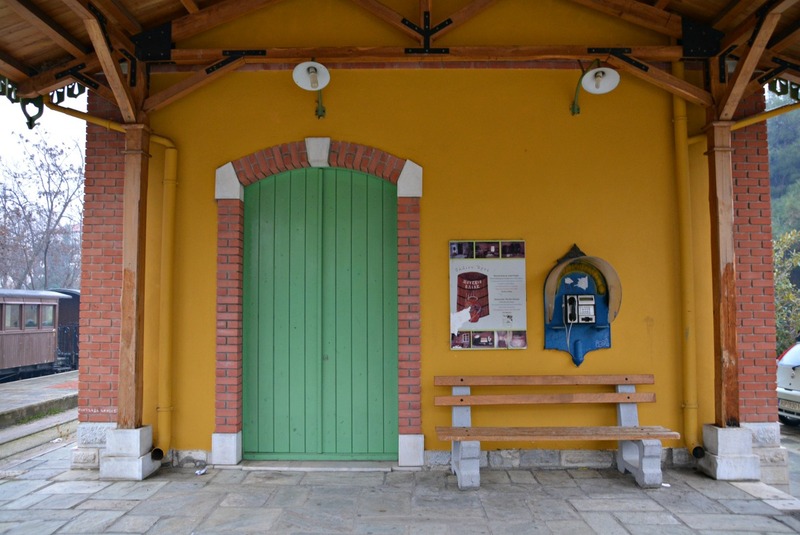 It was once a silk producing center and a place of trade in the 17th and 18th centuries. 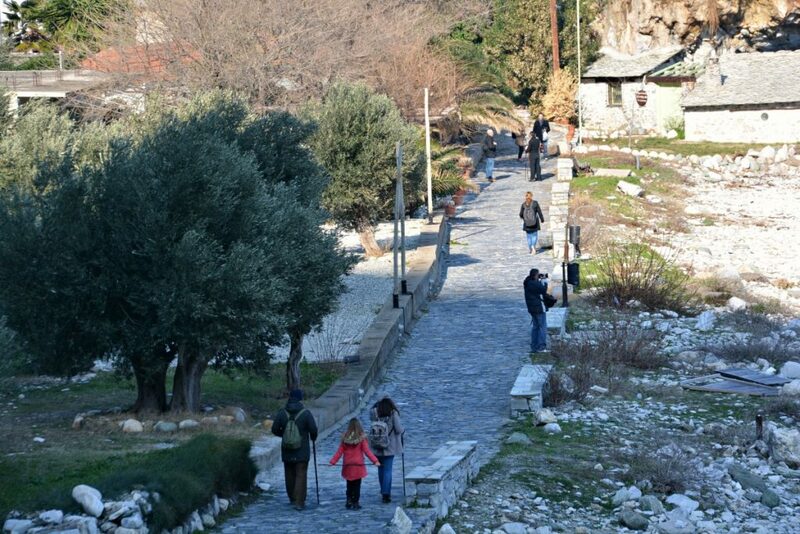 Stop to eat at O Patis taverna and then stroll to the church square. 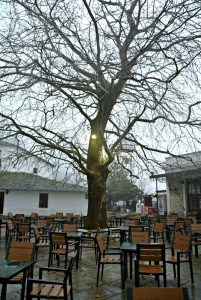 Afterwards, head to the main square where there’s a smattering of lovely cafes and a fantastic old tree waiting for a photo as well. 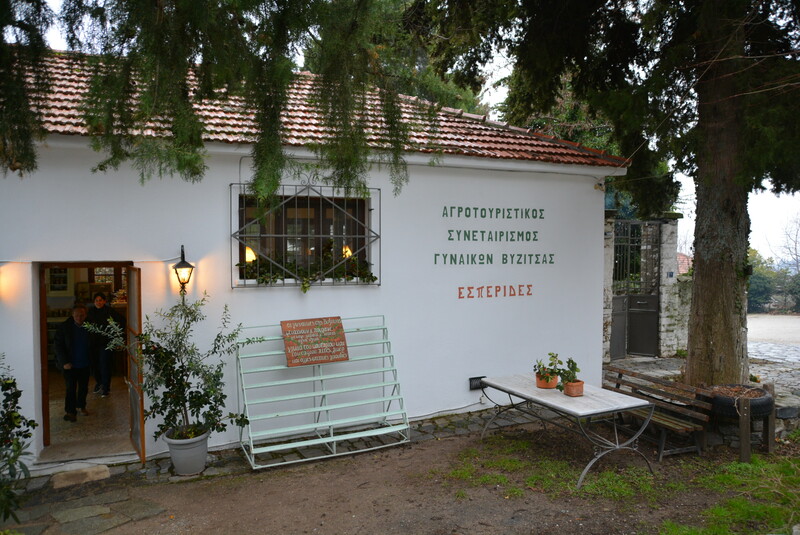 The library of Zagora houses thousands of rare books including the original manuscript of A Few Seconds by Fanis Loverdos. 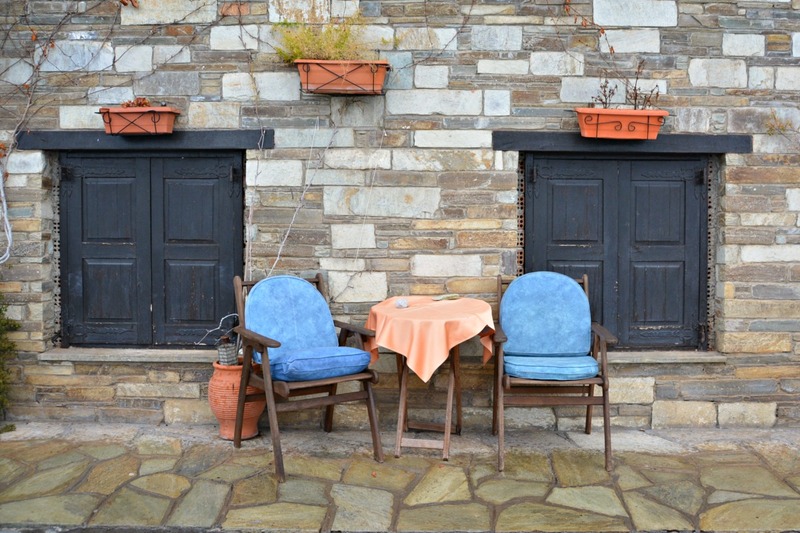 Greek village squares are special places. 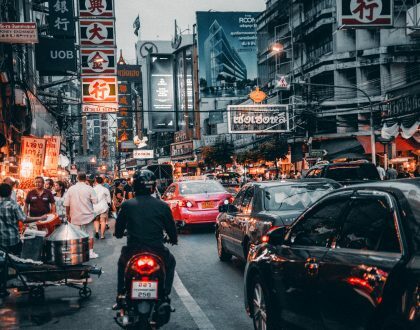 Often, you’ll find the best views, nice eateries, cafes, small churches and in between all of that – the buzz of the season- by which I mean children playing, couples holding hands or groups of friends enjoying the day together. 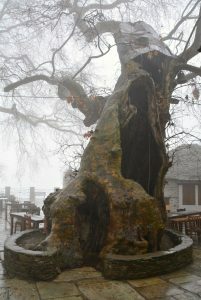 Besides the aforementioned villages, there are other incredible villages that are considered the most scenic in Pelion. If you have more time consider Kissos, Xourichti, Tsagarada and Portaria. 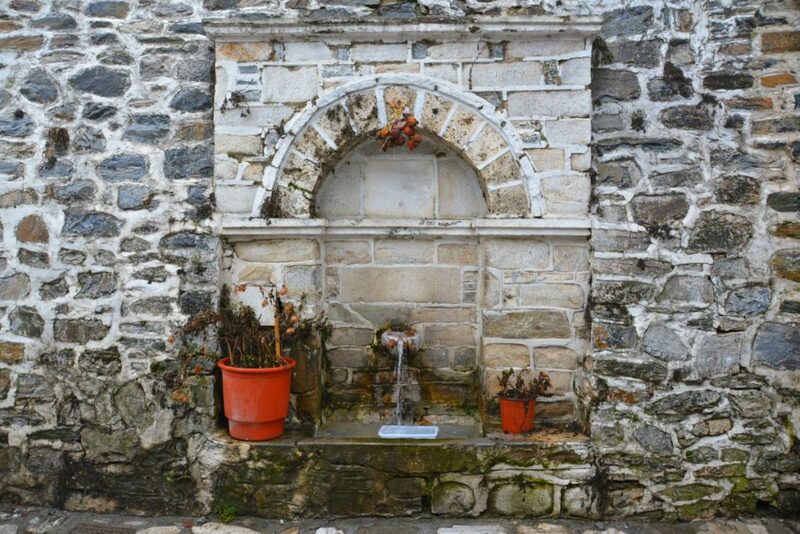 In south Pelion, visit Argalasti which is known for its fountains, Lafkos, Paou, Syki, Chorto and coastal Lefokastro. 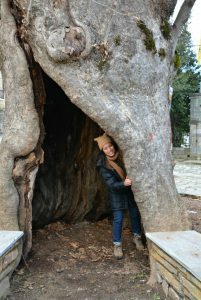 While exploring Pelion, I couldn’t help but notice the amazing, old and storied trees that seemed to be everywhere. 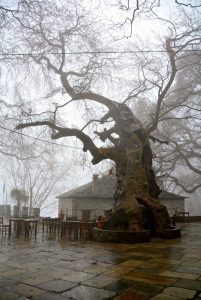 Gigantic plane trees set the stage in the squares or lined the villages and some truly wise ones overlooked the sea. 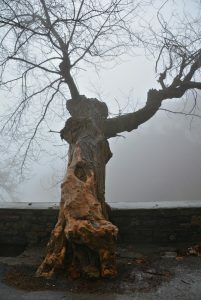 Love the trees in Pelion. 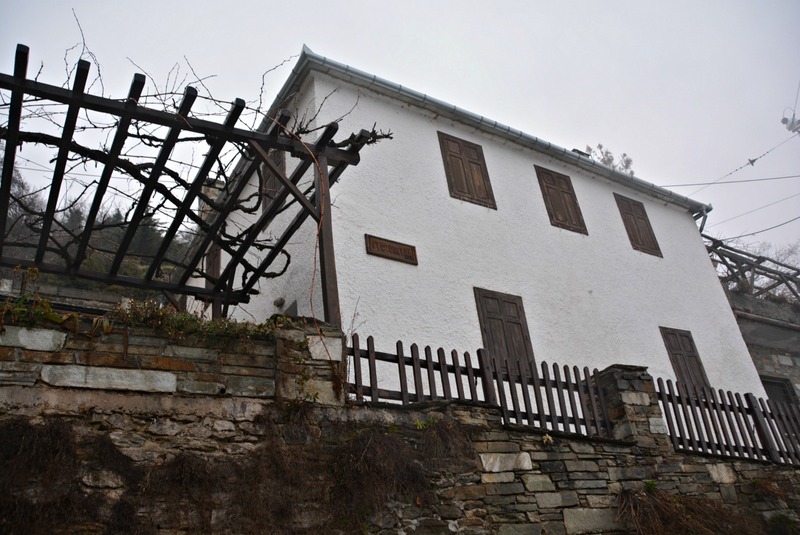 The region of Pelion has a strong network of women’s cooperatives. The first one started in Zagora, in 1993, as a way to keep the local way of producing traditional products alive. 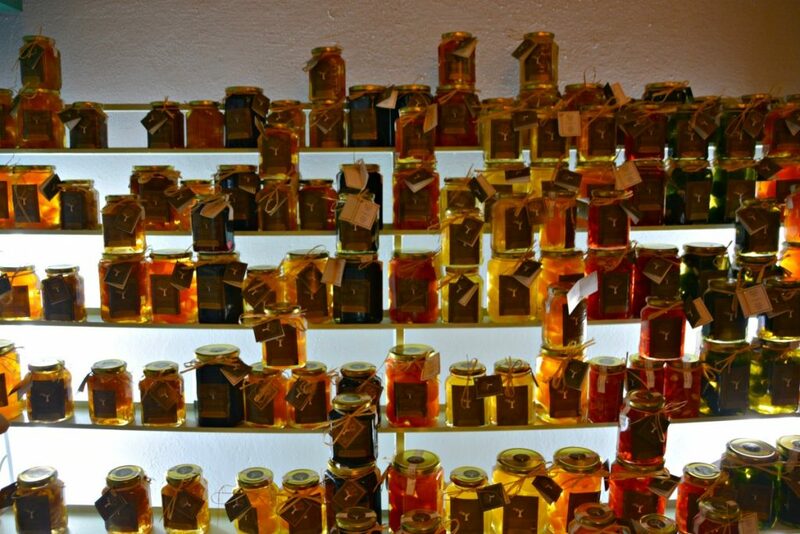 We stopped in the cooperative located in Vyzitsa where a wonderful selection of seasonal jams, marmalades, spoon sweets and other products are produced with love and care. Definitely support them and take an authentic local food product home with you. 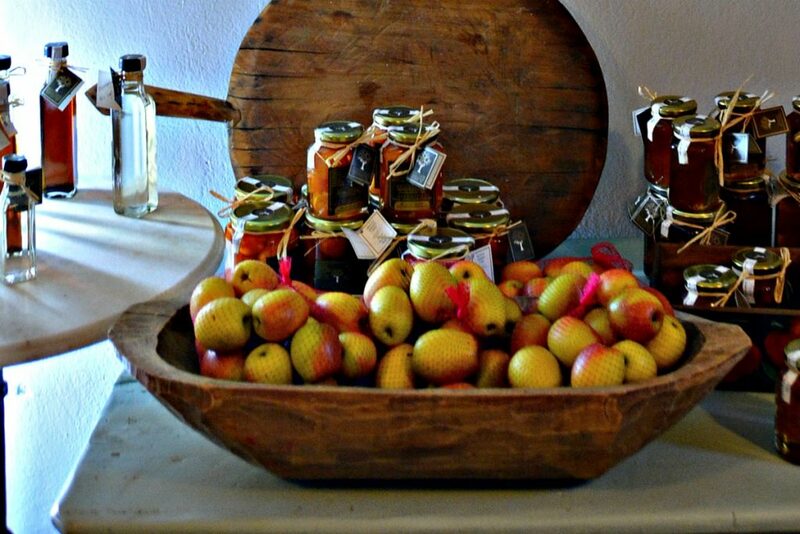 Another one of the top things to do in Pelion is attend a seasonal festival. The region is known for its fruit so it’s no surprise there are an array of fruit themed festivals. The annual International Pelion Festival (July and August) is a cultural festival. Also in August, Portaria hosts an International Dance Festival. Paying homage to Jason and his Argonauts, the Argonaftika Festival takes place in the summer in Afissos. The region is ripe with flowers and locals celebrate that in August in Makrirachi at the Exhibition of Flowers and in May in Alli Meria for the Festival of Flowers. 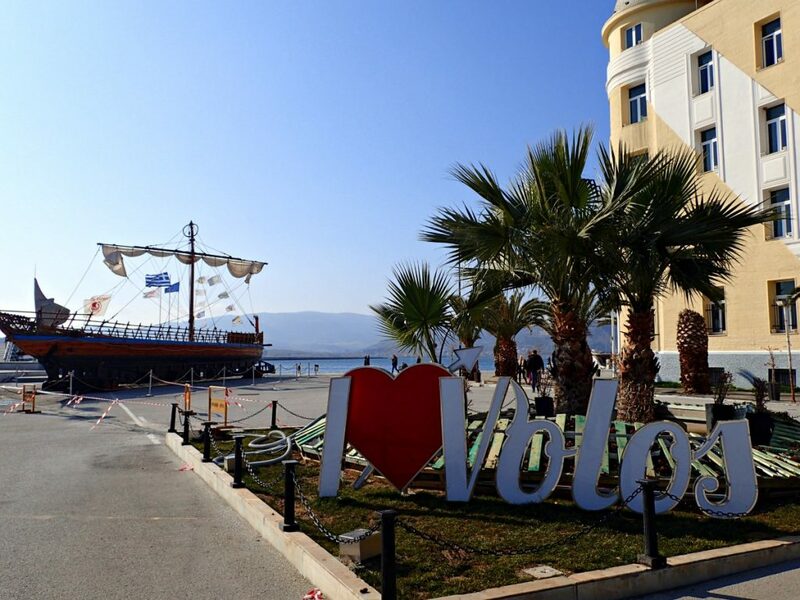 While in Pelion, take time out to spend time in Volos. 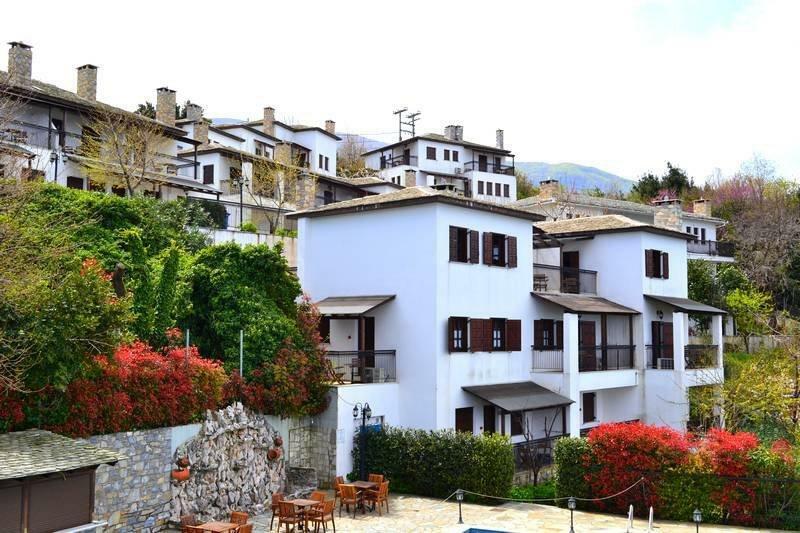 Located at the foot of Mount Pelion overlooking the Pagasitikos Gulf, it is considered one of the country’s most scenic little cities. Stroll the pedestrian Argonauts Avenue on the seafront. See the exact imitation of the Argo, the ship on which Jason and the Argonauts sailed to retrieve the Golden Fleece. 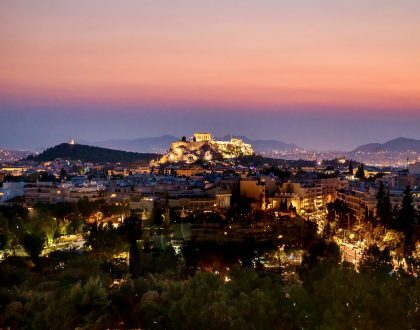 Other highlights include Volos Castle and Agios Konstantinos Park. That sums up my list of the top 20 things to do in Pelion. I definitely plan to be back to explore more! 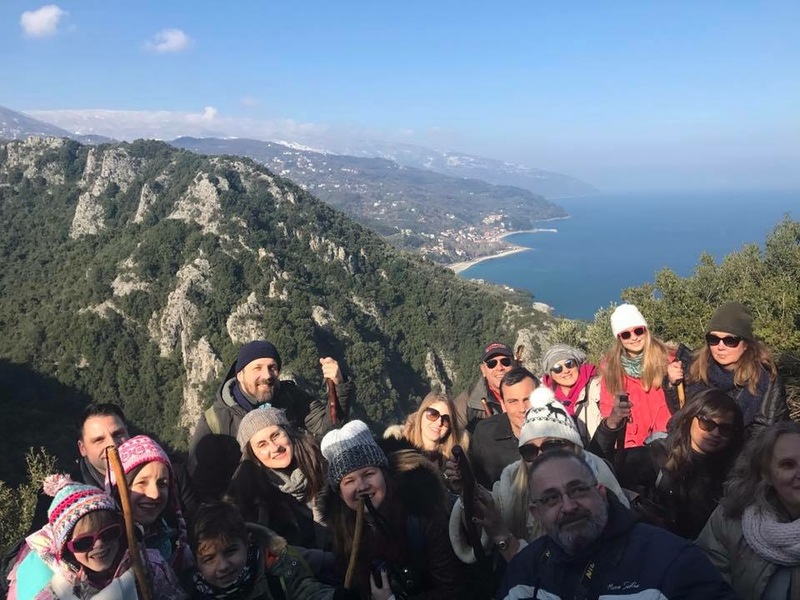 If you have any suggestions be sure to scroll down to the bottom of the post and let me know what makes your top things to do in Pelion list. The closest airport is the Nea Anchialos Airport, about 30 km from Volos. There are scheduled summer seasonal flights and charter flights. The drive from Athens via the National Highway Athens-Thessaloniki takes about 5 hours. I highly recommend O Patis in Zagora for traditional local dishes. I loved the warm elegant dining atmosphere and award-winning cuisine at Kritsa Gastronomy Hotel, a member of the Guest Inn Network. Also, Lepi in Volos has a wonderful tsipouro tasting menu. 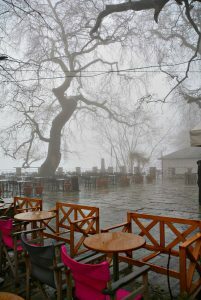 Scenic village cafes (perfect especially during the winter) that I can recommend include Maistrali Hotel Café in Afissos and the warm indoor atmosphere of Manthos Hotel in Chania, near the Pelion Ski Center. I was a guest of the three-star Aglaida Apartments in Tsagarada. All 14 apartments have a fireplace, kitchenette, free Wi-Fi and a view of either the gardens or the sea. 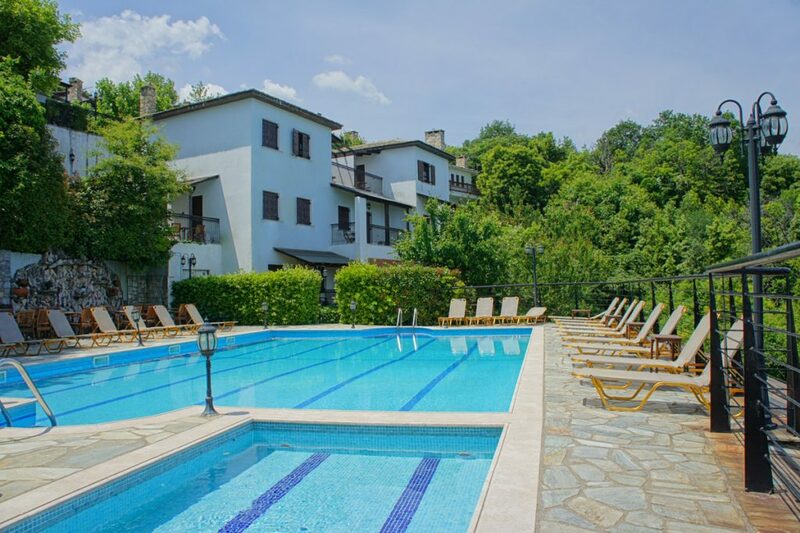 There is an outdoor pool and breakfast is included. Standard rates start at 65 in low season. Stay tuned for more about this not-so-known but absolutely lovely mountain, sea, sun and snow destination in central Greece. Don’t miss a post, sign up for my newsletter! 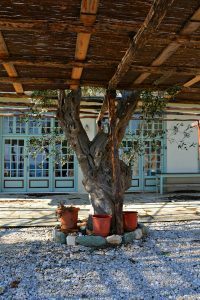 *I was an invited guest of Spyrou Philoxenia, on behalf of Travel Bloggers Greece, to discover the region of Pelion for this review. 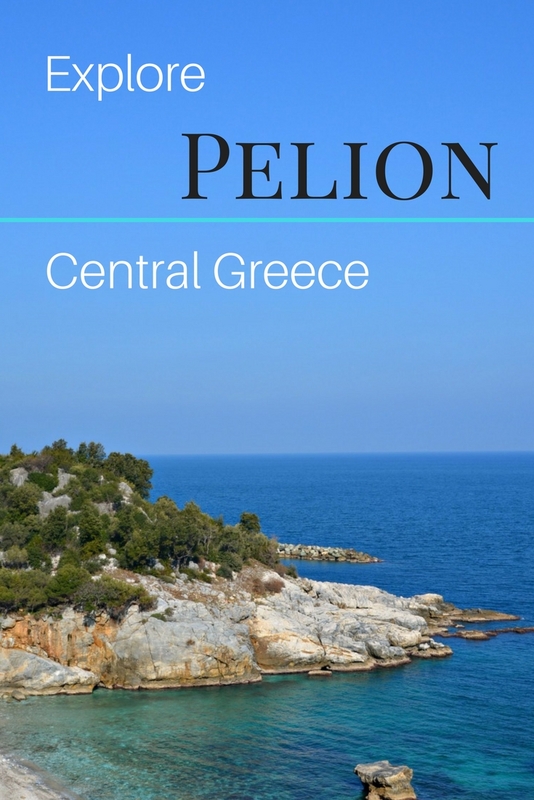 Have you been to Pelion? Are you from Thessaly? 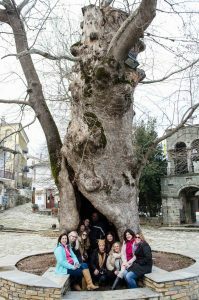 I would love to hear what you would add to this Top Things to Do in Pelion list. Hi Tzina, Oh, thank you! We certainly had all types of weather to photograph in. I want to return in the thick of other seasons. 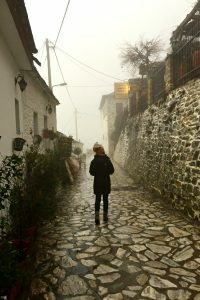 Pelion was just so picturesque! Nice work- the festivals too! Hi Amber, Thanks! Glad you liked the post. I have only been to Chania for skiing and I found the village to be very cosy and traditional. I liked it a lot. I found your article very informative and those other villages you mention I know are quite famous. It would be nice to see them too one day. Indeed. 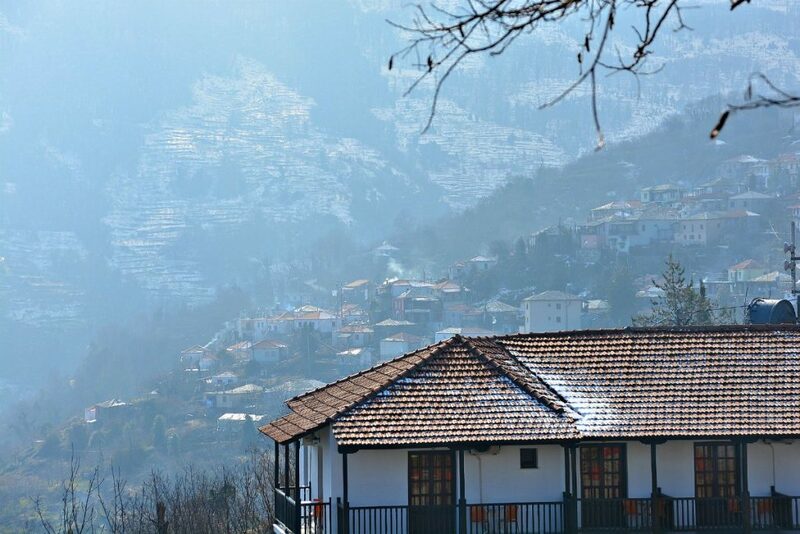 The villages of Pelion are known for their tradition, views and atmosphere. Hope you go one day to check them out! 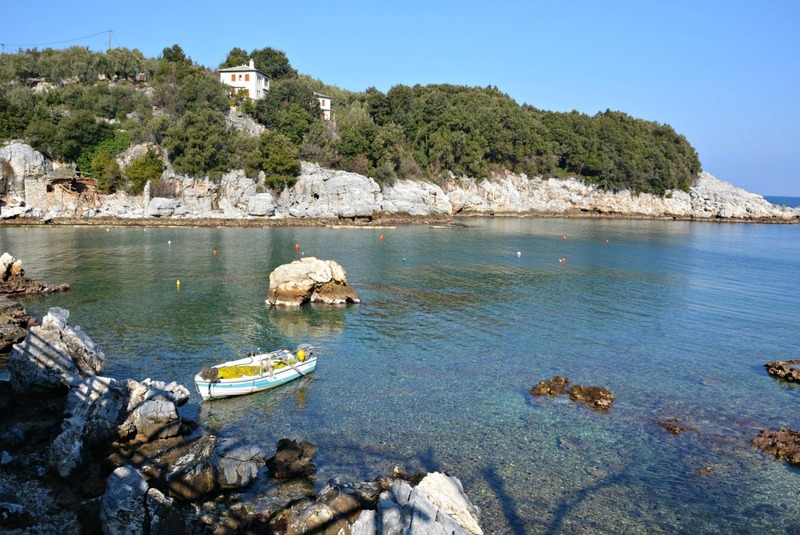 Pilio is a great destination! I didn’t know about festivals! Very interesting! Hi Kathy, Thanks! I think local festivals are an awesome time to visit a destination. Doesn’t always work out with a travel schedule but when it does… they are pretty cool to experience. Isn’t it! 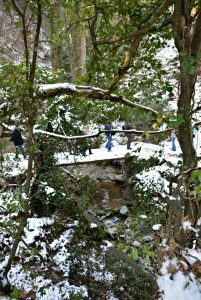 I was awed by the beauty of Pelion in winter. Even the bare trees are perfect as they are. 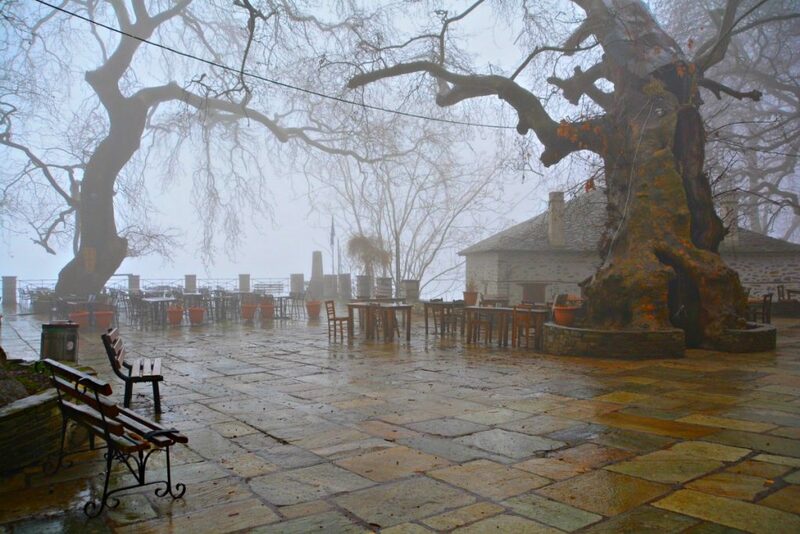 I went to Pelion but never in winter. I will definitely think about it to go to ski… Thanks for all these informations, Marissa ! Glad you liked the post, Aurore. Lots of snow in Pelion for skiing. You traveled to Pelion during which season? You missed the unique village of Lafkos, in South Pelion very close to Argalasti! Beautiful stonebuilt village, great food and warm hospitality. We will be glad if you could visit us next time! 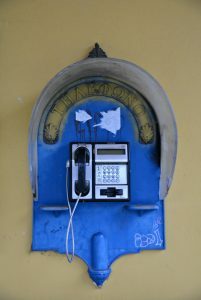 Hi Maria, Lafkos sounds really great. I will definitely put it on my list for next time. 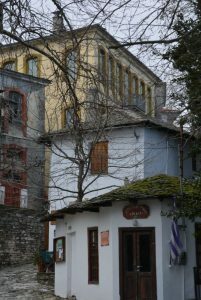 What kind of local food can I try in Lafkos? 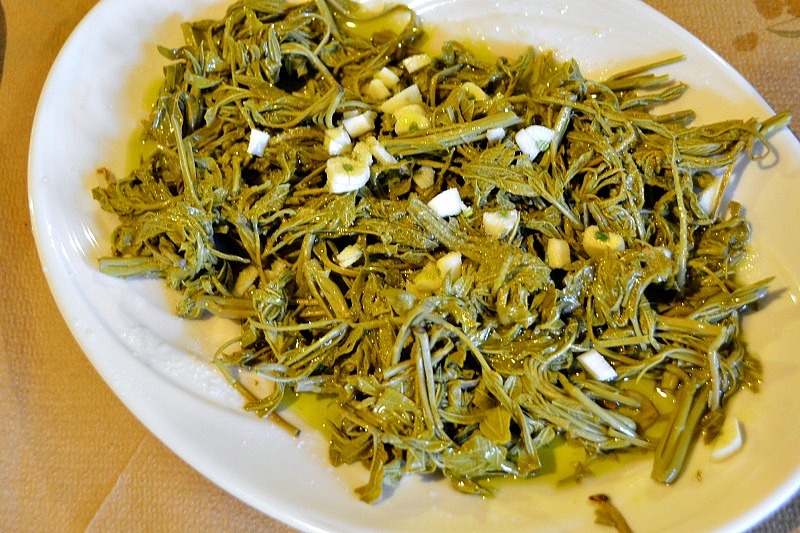 I loved the food traditional to Pelion in general. Meat, pies ,baklavas but also fish the list is long! We will be delighted to see you! Hi Maria, Oh, sounds fantastic. Love the food from Pelion. 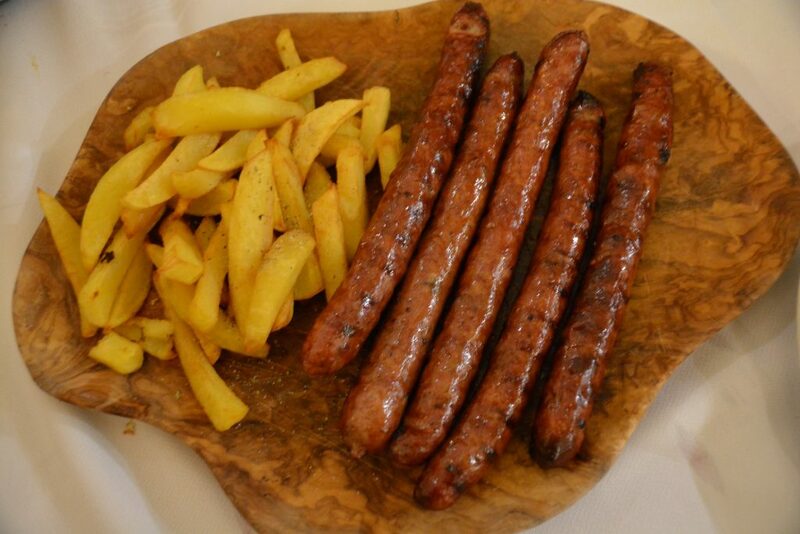 Is there a particular taverna/restaurant you would like to suggest? I want to make sure I go to the one YOU like!! 🙂 I will go there right away when I come to your village. I couldn’t recommend just one!There are four restaurants in the square and one a few steps away each one with it’s own specialities.Make it a date in your programme as the area offers opportunities for activities such as hiking, swimming, horse riding and sailing. 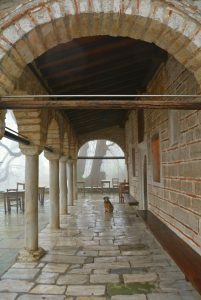 We would be happy to host you in our hotel Archontiko Parisis and show you around! Hi Maria, Oh, I see! Yes, I might have to try them all. Yum! Thank you for letting me know. The horse riding sounds fantastic! And thank you for the invitation to your traditional guesthouse. I just saw the website http://archontikoparisis.com/ and it looks lovely. I will keep it in mind and be in touch. Thanks again for the advice, Maria!